So the idea here was to build a recording studio I could place in a small carry-on suitcase for my upcoming trip to Mexico. I needed to eliminate stuff like mic stands, excessive cables, large clunky gear, processors, and anything that’s typically spread all over my house when I’m recording. Of course I could plug straight into a laptop or ipad, but sadly neither of those devices fulfills my self-imposed legal obligation to record solely on audio cassette. Thankfully, with the help of a local Goodwill and my pals at SuperDigital, I’ve successfully assembled a new Frankenstein setup I like to call The Tabletop Recording Studio. With this setup, the only thing I have to plug in is the 4-track. I’m running the ribbon mic into the Cloudlifter to boost the signal. The Cloudlifter’s going into this newfangled Tascam adapter that allows me to send the signal into and back out of the ipad which I’m using for processing and effects. 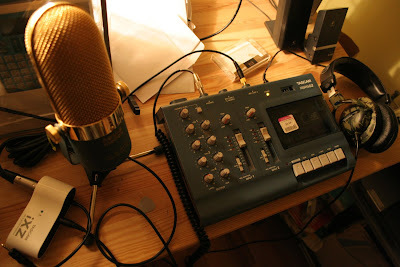 From there the sound travels into the 4-track where it’s captured on tape. This Tascam doesn’t have the DBX noise reduction that my 488 has, so it’s about as lo-fi sounding as you can get, but that’s part of the fun.